American Bulldogs are true grit, true devotion dogs. They are muscular, sturdy, and powerful. Though this breed may have an intimidating demeanor, they are very loyal and loving, always seeing affection and live from other human beings. They have a compact frame that is higher in the legs, with a chest that is wide and a strong athletic sense of power. Its coat is short and harsh, making this breed very easy to groom. 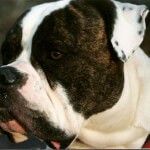 Once used for bull baiting and hunting, the American Bulldog is now known as a working and companionship dog. They are very protective of their owners, staying alert and very self-confident. Because of their strong and protective instinct, they require those same qualities in their pack leader. It requires a great deal of time and effort to maintain this breed's happiness and upkeep. Because of their need for constant attention, failure to give this breed what it needs may result in destructive behavior. The American bulldog is not born aggressive. They are non-hostile dogs that need to be well-socialized and trained at a very early age to avoid any bad habits while growing up. This breed is much livelier and athletic than its English counterpart, and is an ideal pet for an active and confident family. 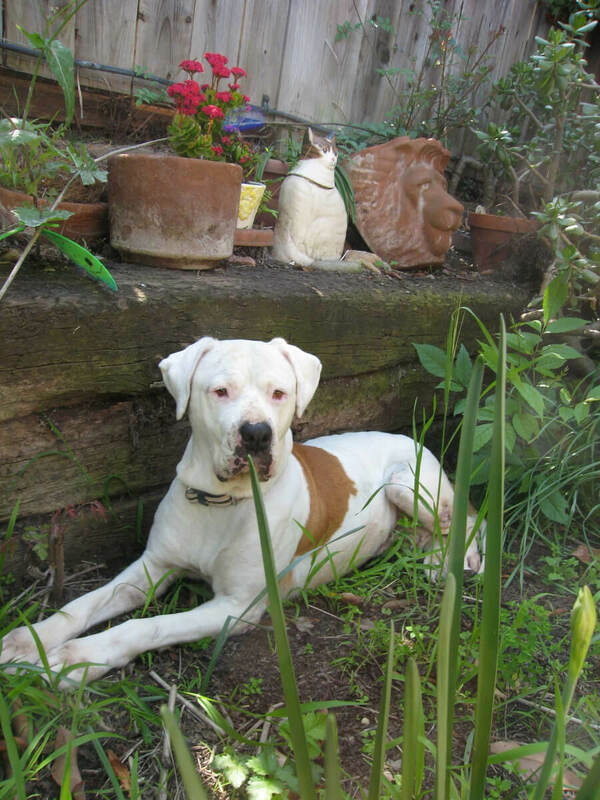 As long as they are given adequate exercise and mental stimulation, the American Bulldog can be happy in an apartment lifestyle, comfortable both indoors and outdoors. 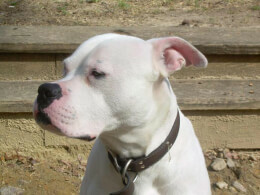 Below are the details and specs for the American Bulldog breed. American Bulldogs are large-sized dogs where males stand between 22 and 28 inches tall, and weigh between 70 and 120 pounds. The female's height ranges between 20 and 26 inches, and a weight that ranges between 60 and 100 pounds. This breed typically lives 10 to 16 years, like similar breeds of its size. 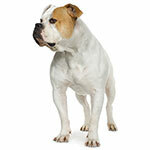 American Bulldogs are loyal, energetic, friendly, and assertive dogs. They are also dominant dogs with an intimidating demeanor, but are actually kind, loving and non-hostile. Others describe this breed as powerful and strong. American Bulldogs crave constant human attention, and love spending time with an owner that is as strong and dominant as they are. They are best around active people interested in developing their athletic abilities in weight pulling, obedience, agility, hunting, and farm work. As long as they are treated lovingly and not aggressively, this breed is comfortable around children and strangers. They may bark at a stranger at first, but once corrected, will introduce itself as a friend. 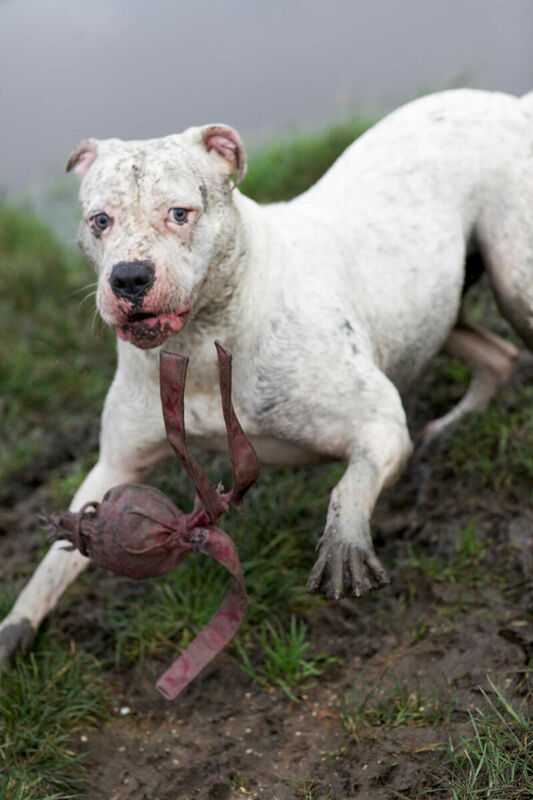 An American bulldog may become aggressive if not socialized properly, therefore it is not recommended that they be left unsupervised with other animals as this may pose to be a problem. 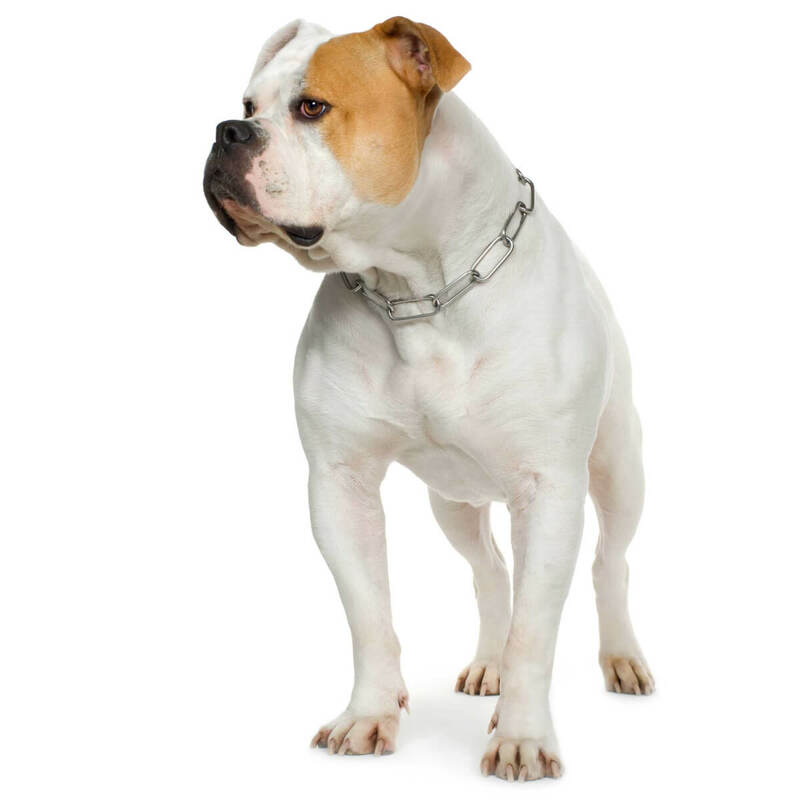 American Bulldogs are moderate maintenance dogs. They require many walks and exercise to exhaust their high energy. They are extremely active, known for being agile and talented jumpers. A lot of exercise is needed to keep them happy and healthy, and one to two hours of exercise a day is highly recommended. Leaving them without any form of exercise can lead them to develop destructive behaviors. This breed is easy to train, as long as the owner is a strong, assertive and powerful pack leader. A lot of positive reinforcement is recommended when training this breed. To avoid any aggressive or destructive behavior, the American Bulldog should be trained as early as six weeks. Training requires plenty of time and effort. Frequent brushing and grooming is needed to maintain their upkeep. It is theorized that the American Bulldog probably descended from the Mastiff and the English Bulldog that exists today. This breed often participated in the bloody sport of bull-baiting. Farmers and ranchers used them as all-around working dogs for various tasks including guards and hunting other animals like bears, wild boar, raccoons and squirrels. This breed was preserved by working class immigrants who brought working dogs with them to the American South. American Bulldogs almost became extinct during World War II. They were scoured in the back roads of the South, and they were bred and revived. Today, this breed is safe from extinction. They are healthily increasing in popularity, either as a working protector or family pet. American Bulldogs are muscular, strong, and powerful. They have a compact frame that is higher on the leg, and the males are stockier and heavier-boned than the females. This breed as a wide chest, adding to the strength of their athletic power. 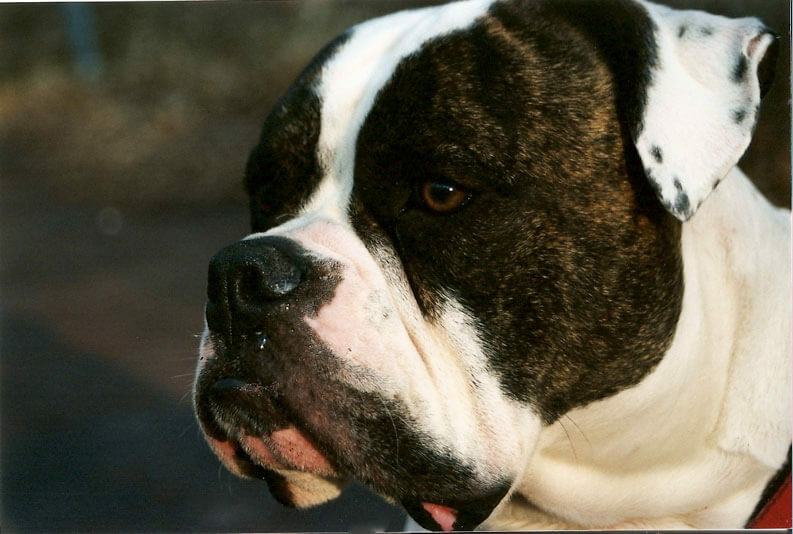 American Bulldogs have large, square heads with a strong jaw. They also have a muscular neck and defined cheeks that are in proportion to the rest of its body. They can have a variety of ear types: cropped, rose, half-price and forward flap. They usually have black rims around the eyes, and those that have pink rims around the eyes were considered a fault feature according to written standard. American bulldogs have a smooth and short coat that can be in varying degrees of the following colors: white, red, brown, tan, fawn, or piebald. These are large-sized dogs. They have longer legs than the English Bulldog. A male's height ranges between 22 to 28 inches, and their weight ranges between 70 and 120 pounds. A females height ranges between 20 and 26 inches, with a weight that ranges between 60 and 100 pounds. Males of this breed are stockier and heavier - built than the females. Their life expectancy can reach up to 16 years. 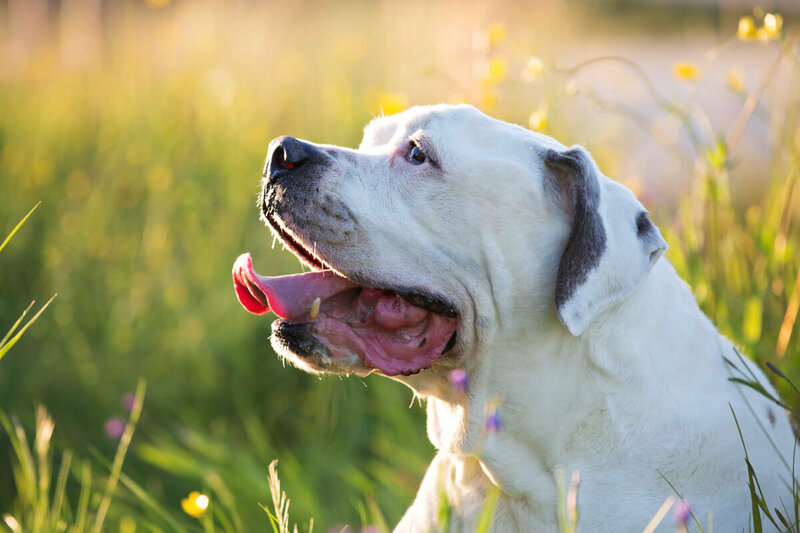 Though dog breeders have long debated the issue, in reality there are two distinct American Bulldog types: classic and standard. 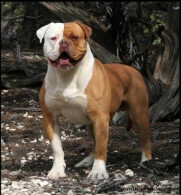 The classic variant is often referred to as the Johnson American Bulldog, and is named after John D. Johnson, a noted mid-twentieth century bulldog breeder. Johnson bullies are the larger of the two varieties, and can closely resemble an English Bulldog. 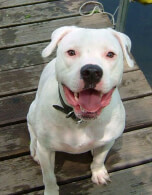 The standard variety, meanwhile, is often called a Scott (after Allen Scott, another famous breeder and one of Johnson's contemporaries); Scott bullies are more athletic, and are closer in resemblance to Pit Bulls. 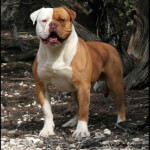 Though other bloodlines exist including the Hines, Old Southern White, and Painter bulldogs, it's likely these sub-types were produced from either the classic or standard variants (or possibly both). These various American Bulldog types all have short, smooth coats. Some breeders offer American Bulldogs of unusual size. The XXL American Bulldog (biggest), for example, can reach 30 inches at the shoulder in height, and weigh up to 150 pounds; Miniature American Bulldogs, meanwhile, can weigh as few as 40 pounds. It's likely these odd-sized variants are one of the above-named types, or hybrids produced by crossbreeding with another breed entirely. You may also see these variants offered as big, huge or giant bully type dogs. American Bulldogs are true grit, true devotion dogs. They are muscular, sturdy, and powerful. They are also loyal, reliable, brave, and determined dogs. This breed is known for its act of heroism toward its master. They have a strong, protective instinct, and they need these same qualities in its pack leader. Though this breed may have an intimidating demeanor, they are very loyal and loving, always seeing affection and love from other human beings. They are very protective of their owners, staying alert and very self-confident. This breed loves people and craves constant attention. American Bulldogs need to be well-socialized at a very young to prevent them from being reserved when they are older. It is recommended that they are trained as early as six weeks for the best outcome. If they are not trained properly, they can be aggressive with other dogs. This breed likes a strong pack leader, one that is firm and confident. Positive reinforcement is recommended when they are trained. They do best with consistency, firmness, and reassurance. American Bulldogs seek attention and affection. Their key drives are prey, defense, food, and fighting. A good balance among all of the listed drives will make this breed a great dog to raise. Members of this breed are gentle and affectionate. They love children and are sometimes referred to as large lap dogs. It is very important that this breed constantly be surrounded by people. Though they may be simple to groom, this breed is known for excessive slobbering and drooling. Well-socialized American Bulldogs are overall great with children. They love being around children and can tolerate more "e;rough play"e; than most other breeds, just as long as they are treated kindly and justly. This breed should never be left unsupervised with children due to their large size, high amounts of energy, and strength. It is important that this breed is well-socialized and trained in obedience at an early age to prevent them from being too reserved. These dogs are not recommended to be around other animals or pets (especially cats), unless they are well-socialized. Their aggression can prove to be a problem. If this breed is socialized to live with other dogs, they can coexist peacefully. It is highly recommended that no cats live in the same household. American Bulldogs need to be well-socialized and trained in obedience at an early age to prevent them from being reserved with strangers. Their behavior and attitude with strangers can range from friendly to standoffish. This breed may bark at strangers at first, but once corrected will introduce itself as a friend. Strangers tend to be intimidated because of its imposing demeanor, but they are actually very friendly and not hostile. 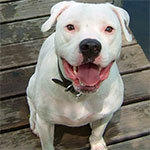 Below are pictures of the American Bulldog dog breed. Moderate maintenance is needed when raising American Bulldogs. Because they shed their short coat all year round, frequent brushing is required. Lack of grooming can lead to problems. Also, heavy exercise is needed. American Bulldogs need vigorous exercise, as they are known to be exuberant jumpers. They need plenty of space to run and jump. 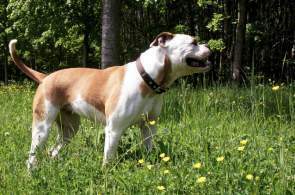 American Bulldogs seek constant attention and if it is not given may become destructive. American Bulldogs require some care and grooming, and baths are recommended only once every two months. This breed sheds its coat all year round, so frequent brushing is required. One thing to keep in mind are their ears. They need to get their ears cleaned on a regular basis to prevent them from catching yeast infection. Another area to watch out for is the mouth. Food can get trapped in the pockets of dogs with pendulum lips or tight faces, leading to tartar and tooth decay. It is important that their teeth are brushed often. American Bulldogs should be taken on long, daily walks. This breed is best owned by active people who are interested in developing their athletic abilities. Their athletic abilities include weight pulling, obedience, agility, hunting, and farm work. American Bulldogs need vigorous exercise to stay fit and happy. This breed is known for their rowdiness and exuberant jumping, especially when young. They should fit right in with an active family. This breed should be kept within a fence or on leash outside and trained through at least basic obedience because of their stereotypical behavior. They are large dogs that take up a lot of space in the car and in the home. They can be either outdoor or indoor dogs. This breed is okay in an apartment setting as long as they are given the adequate amount of exercise and activity. American Bulldogs need a home where there is plenty of outdoor activity. Though they can adapt sleeping both inside and outside, sleeping indoors is preferred. Because they enjoy running and jumping through yards, they should not be kept confined in an apartment without daily walks and outside activity. They love surrounding themselves with family and crave constant attention, so they should never be left unsupervised for long periods of time. A lack of attention can lead to destructive habits. American Bulldogs can sometimes become aggressive, so other pets living in the household are not recommended until the dog is well-socialized. 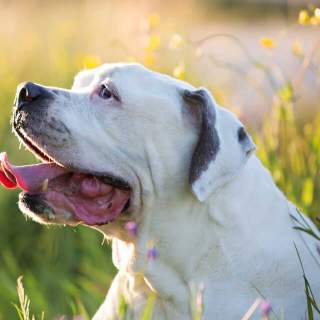 Every dog is a potential victim of heat exhaustion, but the shorter breathing system of the American bulldog puts them as strong risk for heat stroke and heat exhaustion. It is best if the home this breed lives in is air-conditioned. They do not do well in warmer temperatures, and because of their thin coats, also do not do well in too cool of temperatures. These dogs have an average lifespan of 10 to 16 years. Health problems can be found within certain genetic lines and are not common to the entire breed. NCI, Ichthyosis, disorders of kidney and thyroid, ACL tears, hip dysplasia, cherry eye, elbow dysplasia, entropion, and bone cancer are more common. Some are prone to allergies; runny nose or rashes are examples of signs of allergies. Cell tumors are also common.